AT the moment I like to cut my peak lapels quite wide and almost kissing the shoulder. In truth I’ve very rarely done a narrow peak lapel, although sometimes I might cut a narrow notch lapel. But at the moment it seems the wide peak lapel is being seen as a statement in itself. The big difference from before is that it is now really high to the shoulder. It used to be above the button-hole but it’s now almost an inch and half higher than a couple or so years ago, as seen on this suit I had commissioned by a Los Angeles-based Englishman. Made up in a cloth from John G Hardy its colour can differ a little depending on the light. It’s a superlight flannel…9oz and while it looks grey there’s also a little bit of tan coming into the cloth. My client is a very stylish guy and loves that minimalist look. For example, on the trousers (which aren’t pictured here) he only has one pocket, front right. Check out the one-button cuff too. It’s the same size as the front button. There’s a hint of 60s retro about that but I think it really works and it certainly matches my client’s overall look. 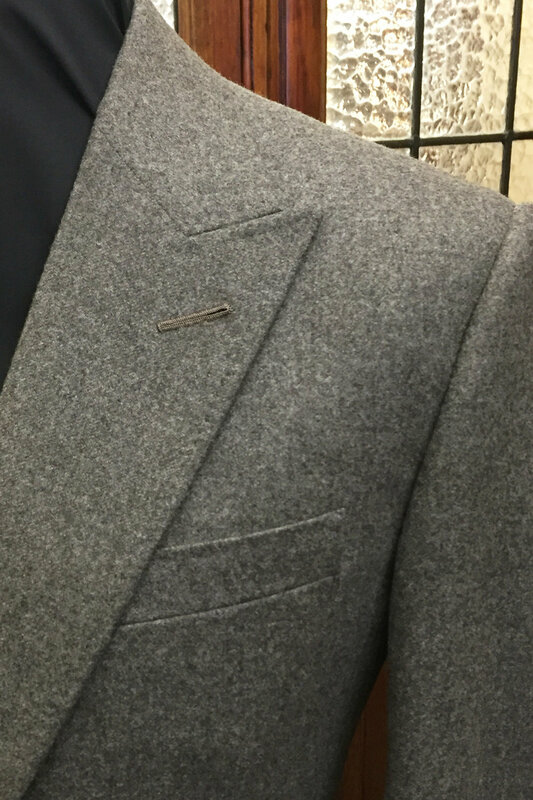 Lastly, back to the peak lapel…that’s a great shape isn’t it, even if I say so myself!